San Francisco and the Bay Area face a 62 percent chance of a large earthquake in the next 30 years. During a 2010 review of the city’s disaster preparedness and recovery strategies, Rob Dudgeon, deputy director of the San Francisco Department of Emergency Management (DEM), realized that the agency needed a more effective strategy for communicating with the public. Working with Alicia Johnson, DEM’s resilience and recovery manager, the agency chose the innovative track of hiring IDEO, the renowned design and innovation consultancy, to develop a new preparedness platform called SF72. Seventy-two represents the number of hours following a major emergency during which people should be able to take care of themselves before help arrives. In this cross-sector — or intersector — collaboration, DEM and IDEO partnered with hundreds of business and nonprofit organizations, and the city’s residents over a period of three years to create the new platform of education, outreach and public information, which serves as a community hub for emergency preparedness. The website SF72.org, as well as a host of outreach programs, has helped to create a new culture of “positive preparedness” for residents, organizations and businesses. Positive preparedness aims to show community members how to tap into their existing networks, using tools they already have to support each other after an emergency. SF72 encourages resilient behavior by providing a platform for people to connect. On the website, visitors find videos of San Franciscans sharing stories about how to prepare for disasters, providing the opportunity for others to learn how to connect with friends and neighbors. The “Connect” forum allows individuals and organizations to link up with other people in their community, and users are encouraged to pledge skills and resources such as generators and baby-sitting services. The mobile app includes a geo-track feature that allows users to find loved ones and establish meet-up spots during an emergency. A section of the website is dedicated to real-time information during an emergency, including crowd-sourced reports delivered via Twitter from residents, businesses and nonprofits, ranging from road blockages to available services. Businesses and nonprofits can contribute to SF72.org. They can also access in-person education, including presentations and connections to resources, specifically for these organizations. Share a vision of success refers to the agreement on a set of project goals and ideal outcomes that clarify the mission and priorities of the collaboration. In conceiving new ways to communicate with San Franciscans, DEM’s Resilience and Recovery Management team sought to canvas public opinion on the key concepts of “resilience” — an idea at the heart of positive preparedness. As they discussed their terminology with other government agencies and with non-governmental groups, however, they found that individuals defined “resilience” differently depending on issue and audience. This revelation convinced the team that a “one-size-fits-all” definition would be insufficient. This led to the formation of an agile and finely nuanced platform that would accurately survey and serve the individual residents of San Francisco and the Bay Area. The process of simply defining the goal was a challenge, but essential to the process. Build a common fact base refers to consensus among partners as to what facts relating to the issue collaboration are relevant, which allows partners to develop shared understanding of the issue and hone collaboration strategy. Rob and Alicia’s team decided that DEM needed to abandon the traditional model of emergency preparedness and collaborate with other sectors. They approached IDEO with a question: How could they motivate citizens who weren’t already aware of positive preparedness? To find an answer, IDEO initiated qualitative interviews with San Franciscans and meetings with business and nonprofit organizations, religious leaders and community representatives. San Francisco DEM and IDEO held weekly meetings with each other to discuss and analyze what they were learning from residents. Through this process, they learned that preparedness is not only about tools or supplies but connections to other people. The team continually tested the technologies that DEM and IDEO developed. Representatives from every sector contributed to identifying the components that should be included in SF72. The result of the collaboration is a platform truly made for the people of San Francisco. After launching in late fall of 2013, SF72.org forged a first-of-its-kind social networking partnership to expand its reach this spring. It announced a new partnership with Nextdoor – a social network through which neighborhood residents can communicate about issues ranging from lost pets to crime. The SF72-Nextdoor partnership withstood its first test during a March five-alarm fire that engulfed and ultimately brought down a six-story, 80-foot-tall building that was under construction. SF72 communicated alerts and updates to residents via Nextdoor throughout the event. “We can actually share information within all of the neighborhoods within San Francisco, or we can geographically target neighborhoods if something is happening,” Kristin Hogan, DEM’s program manager, told Government Technology. The partnership is a first for San Francisco and Nextdoor, and there is hope that similar partnerships will spring up around the country. SF72.org aims to show community members how to tap into their existing networks, using tools they already have to support each other after an emergency. Nextdoor provides a well-established network where conversation and exchange among residents is already happening. Their partnership illustrates how an already successful intersector collaboration can leverage the resources of a new partner to broaden its reach, engage residents, and, in this case, save lives. 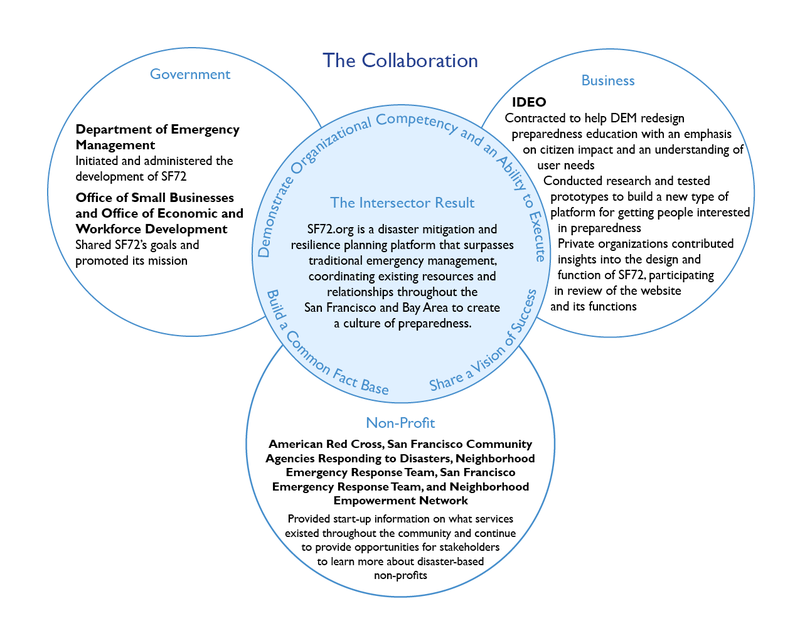 Read The Intersector Project’s full case study on the SF72 collaboration, “Creating a Culture of Disaster Preparedness in San Francisco” here.